This is a great book for people who are just getting started or interested into the world of product management. I, myself, and not a member of the industry, but I have had thoughts over the years about trying to get into it and maybe making a career jump. This book was really helpful in teaching about some of the best techniques for creating an innovative working environment. If you’re like me and every time you’ve thought about moving into a technologically advance field, you just get bogged down by not knowing quite where to start, then this is the book for you. Graffius is not joking when he says in his title this has step by step instructions. He is quite thorough with his details. This book gave me a lot of knowledge that I didn’t have before. I still don’t know if it’s a world that I want to go into, but it’s nice to know that if I do this book gave me the first steps in knowing what to do. Especially because Graffius broke down the information into easily understandable portions. It was also helpful to see all the extra things he added to the book for resources that have more materials to look at. People like me really need that kind of thing. This book is a must have for anyone looking to become innovate in a quickly changing world. You will fin all the ideas in the book helpful. If you’re already in the industry, you’ll want to implement these strategies immediately. 5,0 de 5 estrelasA great quick start guide to deliver quality projects on time and in record time! Technology advances quickly and business needs to be able to act and react accordingly in project implementation and time to market for their products. In order to do that and be effective, the Agile Scrum methodology is the process of choice by an ever increasing number of businesses. This manual gives a step by step tutorial for implementing the Agile Scrum method. From Vision to Team Formation to Product Story creation and Release this guide leads the student through each phase. How to plan for and execute a sprint and how to determine how long your sprint should be based on your project are also given spotlights as their importance warrants in this comprehensive guide. The author breaks the framework down into ten sections to make the methodology easier to understand and he includes best practices and examples of what a successful implementation should look like. This includes planning, creating the backlog and a great explanation of the burn down method. Additionally, the author gives extensive supplemental materials for those that want more detailed information or more resources to consult when considering implanting the Agile Scrum method. If you’re considering moving to Agile, this should be your first stop for planning that important change! Having dealt with Scrums in an Engineering environment, I could immediately see the benefit of this type of meeting right away, however as usual with such things the implementation was not up to par. I will say that while reading “Agile Scrum: Your Quick Start Guide with Step-by-Step Instructions [Print Replica] Kindle Edition by Scott M. Graffius (Author)”, reminded me of “ Robert’s Rules of Order by General Henry M. Robert” as far as its indepthness, but with less formalities and more practicalities. And this was exactly the implementation points we were missing to utilize Scrums to their fullest potential. I have to agree with the Agile moniker in so many ways it really does speak to the versatility that this method of this method can offer. Usually Scrums come from the Information Technology arena, however with Agile Scrum the applications are much more broad. This really could be the right way for businesses to handle project management, and perhaps even family budget meetings and the like. This is the perfect edition to what I call the business management trifecta now, 5S, Lean Sigma Six, and now the addition of a properly implemented Scrum. 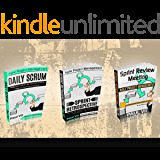 For any project manager, or even just any leader in general I can not recommend “Agile Scrum: Your Quick Start Guide with Step-by-Step Instructions [Print Replica] Kindle Edition by Scott M. Graffius (Author)” high enough. Agile Scrum Your Quick Start Guide with Step-by-Step instructions is exactly as the title shows. The author, Scott M. Graffius, includes graphs and colorful charts throughout the book to prove and emphasize the instructions and descriptions. The book begins with impressive awards and honors bestowed upon the Agile Scrum Guide by Graffius. The book is laid out with outlines, graphs, text boxes, and colorful images. This layout adds dimension to an already notable instruction guide. Each chapter focuses on a specific area of project management. In the chapter, there are charts of cycles followed by a plan to implement the completion of a project in any business. This type of success combined with urgency is crucial for all project completions. An outstanding guide! I recommend this book to anyone who is part of a project team or is the project manager. Upon finishing this book, I understood why so many honors were given to the Agile Scrum Guide. As someone who had worked extensively with the Scrum methodology before diving into this book, I still found it really interesting and helpful. It's a quick start guide, sure, but it perfectly explains the hows and whys of all the basics of Scrum. If you don't know what Scrum is, it's an agile methodology to manage team (and even individual) projects better and focus on pushing out quality products in time, based in sprints and having a well organized backlog of pending tasks. 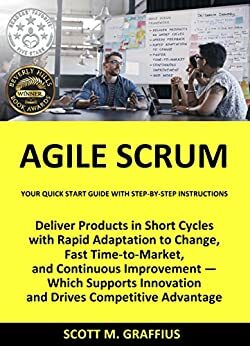 The book does a great job explaining everything in detail, and if you're looking to get into agile, I cannot recommend any other book better. Something that stands out of the book by Scott M. Graffius is that it doesn't focus only on software developement, the most popular use of Scrum, but makes it more general. All in all a really good read and a great starting point for improving your product making methodology. Worth the read equally for project managers, developers, and beginners.